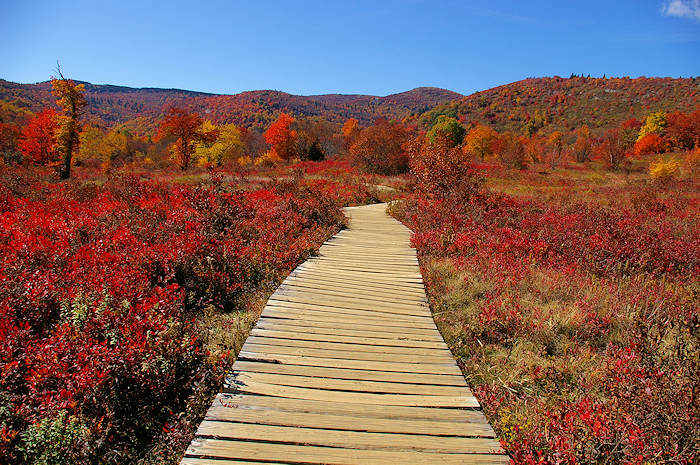 Graveyard Fields is a very popular hiking trail on the Blue Ridge Parkway (Milepost 418.8) south of Asheville. The Yellowstone Prong is the water source for two waterfalls in a mile-high valley filled with wildflowers and surrounded by the 6,000-ft. peaks of the Blue Ridge Mountains. The area got its name years ago from the tree stumps that looked like grave stones in a graveyard setting. The trees were toppled by a huge wind several hundred years ago. Then in 1925, an intense fire burned the recently logged area, and the forest has been slow in recovering since. It's one of the few hiking places along the Parkway with restrooms! Take a short hike to a beautiful waterfall or a much-longer 3.5-mile loop through the meadow to a second waterfall. Lower (or Second) Falls in photo above is just 1/3 of a mile hike from the parking area. While it's a short hike, you'll have quite a few steps and uphill sections on your way back. Start from the overlook on the Blue Ridge Parkway. There is a map on the sign at the parking area. Take the trail at the lower end (right side looking away from Parkway) of the parking area. This descends down a paved path through a thick patch of rhododendron, down some steps and to a bridge. Cross the bridge, turn right along the trail until you come to the first trail intersection to the right, and descend a long flight of steps to viewing platform for Lower Falls. Get a closer look from the boulders at the base of the falls. 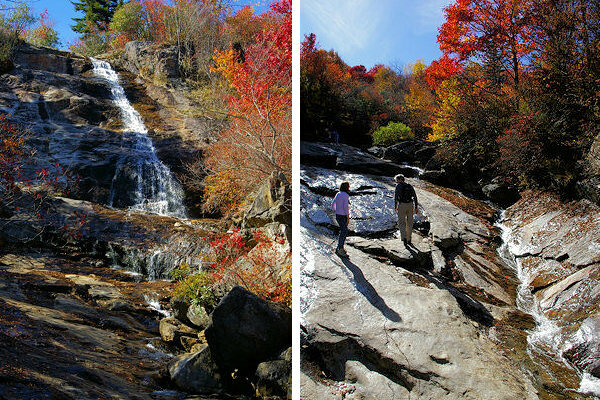 From Lower Falls, you can also continue on the 4-mile Graveyard Fields Loop. To continue on the loop to Upper Falls, do not re-cross river on the way back to the car. Continue straight ahead. The next waterfall is just over a mile ahead. Most of this hike is fairly level. The last section has a bit of a climb. The trail splits just before the Upper Falls. Keep right to reach the main drop of the falls. If you go to the left, climb up the rock face for the best view of the waterfall. On the return from the upper falls in about 3/4 mile, turn right off the trail to cross the river on a wooden bridge. Continue on this trail to the exit at the upper end of the parking area. Signs are very minimal, so this trail map will help! It's a local's favorite stop for wild blueberries in August. Expect overflow crowds on summer and fall weekends. Go early! On hot summer days, Lower Falls is a popular swimming hole for splashing around in the cool mountain water. The rocks are slick and there are no lifeguards on duty. So be careful! 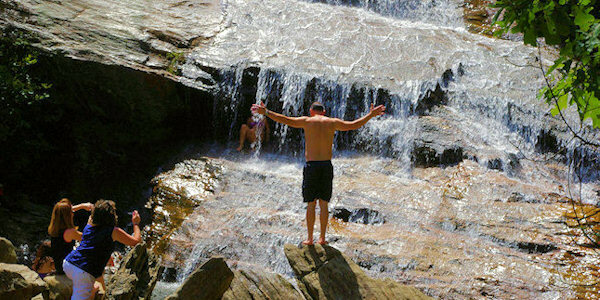 Less than two miles north on the Blue Ridge Parkway is Skinny Dip Falls - a wonderful spot for diving, swimming and soaking. 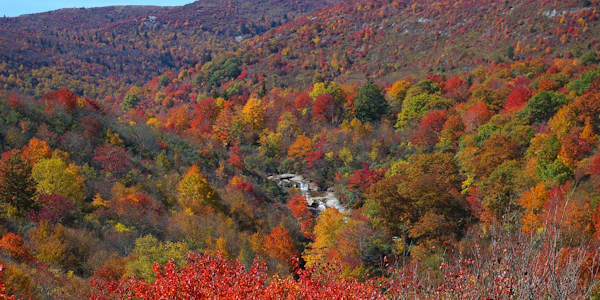 Peak fall color is early October - one of the first spots in the mountains for color. 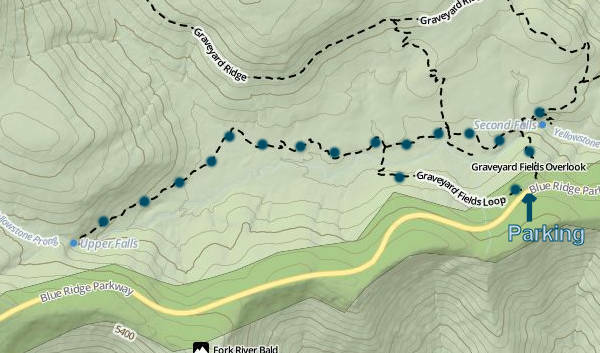 The Pisgah National Forest rangers have closed Graveyard Fields for camping due to bear activity. You can camp nearby at Black Balsam Knob area, but you must store food in a bear-proof commercially-made canister constructed of solid, non-pliable material manufactured for the specific purpose of resisting entry by bears. Do not rely on GPS! 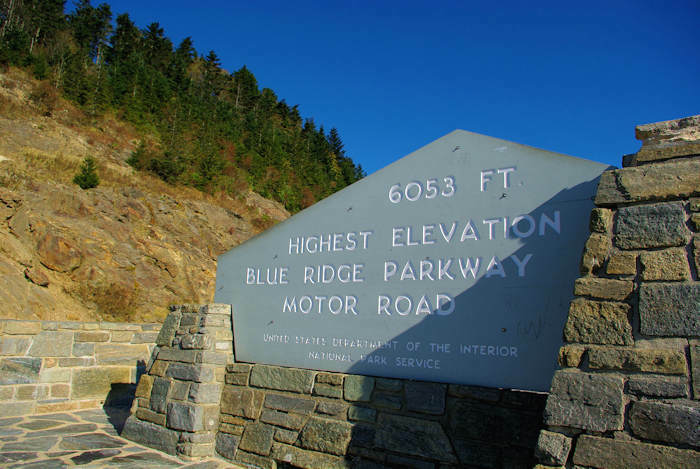 Simple drive the Blue Ridge Parkway south from Asheville to Milepost 418.8, about 37 miles southwest of downtown. It's about 10 miles past Mt. 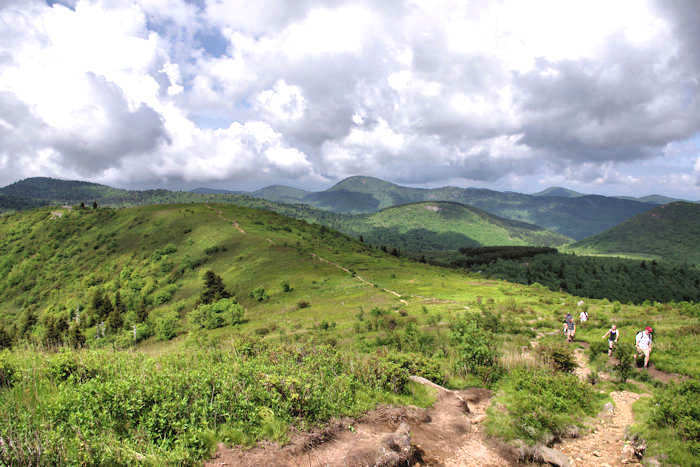 Pisgah. Heads up: this section of the Parkway is often closed in the winter for ice and snow. 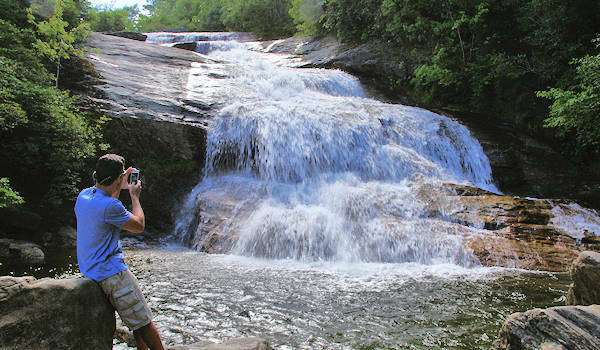 See our Top 12 Parkway Waterfalls. 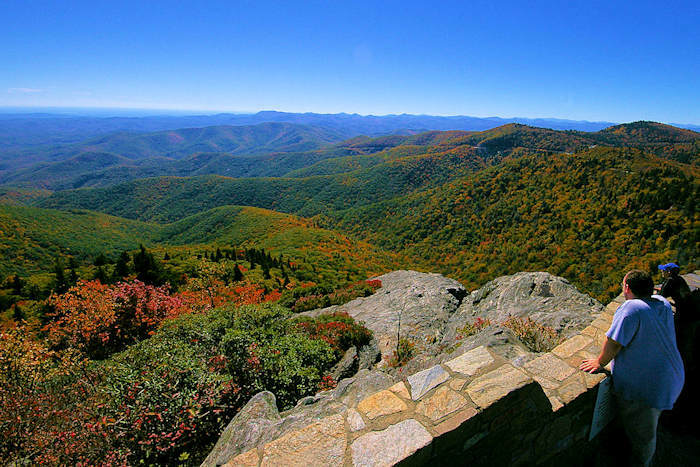 For a mile-by-mile list of other places to see along to the way, go our Blue Ridge Parkway Guide. 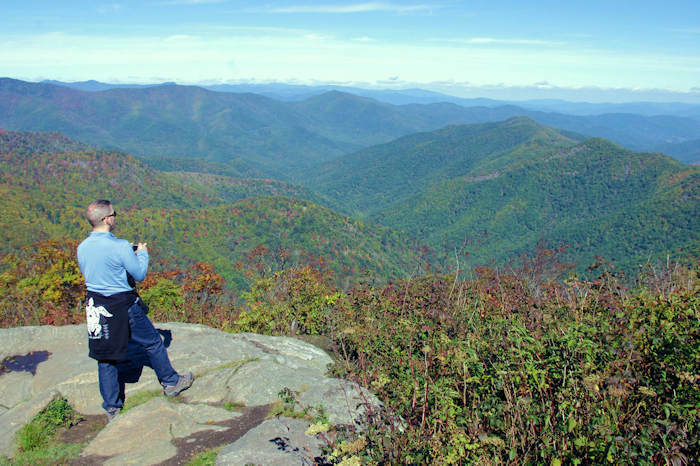 Nearby Hikes: Black Balsam (amazing hike), Sam Knob, Devil's Courthouse. 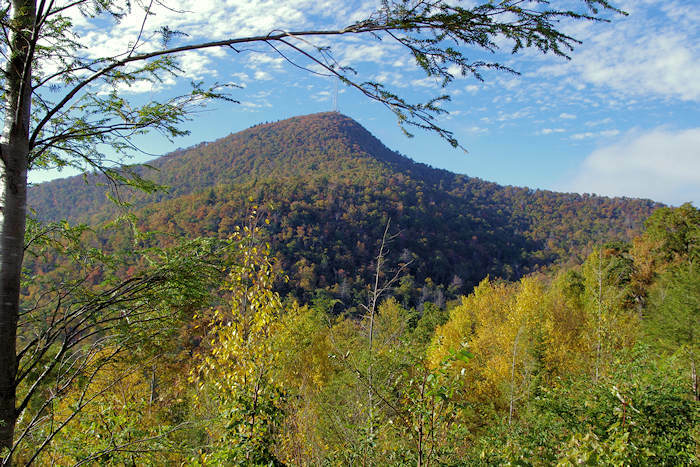 You can hike to Devil's Courthouse (eight miles) via Mountains-to-Sea Trail.